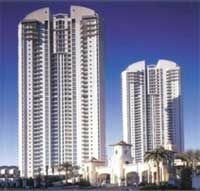 Under the development of Turnberry, Ltd., Turnberry Towers is an affordable balance to its luxury counterpoint Turnberry Place. Even though the prices at Turnberry Towers may be more ideal, its lavish services contribute to the extravagant environment offered by this high-rise condominium community. With four floor plans ranging from 915 square feet up to 1,937 square feet, the two 45-story towers will host residences overlooking the Las Vegas Country Club and the beautiful Las Vegas Strip. The units inside Turnberry Towers will offer beautiful, Italian marble baths and spa tubs, granite topped European kitchen cabinetry, upgraded appliances, and 9-foot ceilings. The prices for this high-rise range from $550,000 to more than $1.3 million. All of its buyers will receive a two-year membership at the Stirling Club, including monthly dues. Additionally, the exclusive facility features casual and fine dining, a European anti-aging spa, a fitness center including a virtual reality system, a Pilates studio, beauty salon, spas, saunas, steam baths and an indoor lap pool. Finally, the club offers its members an entertaining night club with live jazz music, a piano lounge, cigar room, tennis courts, and an outdoor mosaic pool.